The commuter bus, a private initiative spearheaded by a pro-Stalin blogger, is to run through Saint Petersburg's historic centre as Russia prepares to commemorate the 65th anniversary of the defeat of Nazi Germany on May 9. Lined with palaces and cathedrals, Nevsky Prospect is a major thoroughfare of Saint Petersburg, Russia's former imperial capital. However, later in the day the bus was attacked by unidentified individuals who completely painted over the portrait, the Interfax news agency reported. 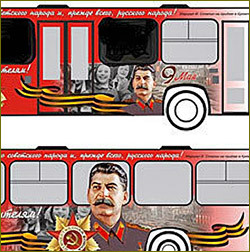 "Vandals and so-called freedom fighters spoiled the bus, painting it over," Viktor Loginov, who initiated the portrait's placement on the bus, complained. "The bus will be washed and tomorrow it will hit the road with the same picture," he vowed. Mr Loginov, a young Russian blogger, raised money from various donors to pay for the bus to cruise the streets with a picture of the former Soviet dictator for two weeks. "We are not trying to whitewash Stalin or to clear his name of the crimes attributed to him, imaginary or real; we are just trying to underscore his critical role in our shared Victory," he wrote in his blog. Critics have condemned the bus project for glorifying a dictator who was responsible for the deaths of millions of people in the notorious Gulag prison camps and in the forced collectivisation of agriculture. "This is an insult to those people whose loved ones died in Stalinist repressions," Maxim Reznik, head of the Saint Petersburg branch of the liberal Yabloko party, told AFP. In April the Memorial human rights group sent a letter to Saint Petersburg governor Valentina Matviyenko asking her to stop the bus project, calling Stalin "one of the most terrible criminals of the 20th century." Despite the brutality of Stalin's rule, many Russians admire him for his role in the victory over Nazi Germany in 1945. Stalin ruled the Soviet Union for nearly three decades until his death in 1953. City news archive for 07 May' 2010. City news archive for May' 2010.